By the grace of God, I have once again been elected as your President. The people have spoken and their collective will has prevailed. I give praise and thanks to Almighty God for the great honour bestowed on me to lead this nation. This is a win for every Sierra Leonean; and I thank every Sierra Leonean for bringing about this victory for this land that we love. Sierra Leoneans displayed maturity, patience and tolerance during the elections. These are enduring Sierra Leonean values, and we must continue to display them to sustain our peace, our democracy and our development. We deeply appreciate the commitment of the National Electoral Commission, Political Parties Registration Commission, and the Security forces to the constitution of this country and the sacred tenets of democracy, peace and security. We also applaud the many other state agencies, domestic and international monitors, civil society groups and the media for their positive contribution to ensuring credible, transparent and peaceful elections in the country. My fellow Sierra Leoneans, you have given me, and my party, the All Peoples Congress, the mandate to govern our country for the next five years. You endorsed the achievements we made with the Agenda for Change and asked us to continue on to the Agenda for Prosperity. This is my new contract with you, we will focus on creating jobs for the youths, and on training our youths to seize the immense employment opportunities we are creating in the construction, mining, agriculture and other sectors. We will continue with our infrastructural development programmes; we will continue to attract investment; we will continue to fight corruption; we will continue to protect and promote the rights of every woman, every man, youth, child, journalist, and civil society activist. The time for politics is over, the moment for continuing the transformation has come. This is the time for all of us to embrace each other. In the name of Mama Sierra Leone, let all APC supporters embrace every SLPP supporter and supporters of other political parties. I am inviting the leadership of the SLPP and other political parties to join the leadership of the APC in moving this country forward. The job at hand requires the goodwill and positive energy of the membership of all political parties. 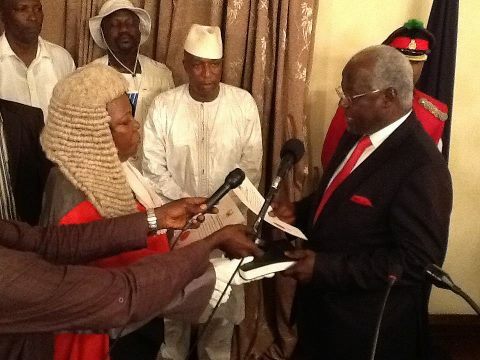 Fellow Sierra Leoneans, democracy respects divisions; good governance transcends divisions. I will make sure that the fruits of the Agenda for Prosperity are equally distributed in every district and region of the country. Our creation of jobs will be for youths all over the country; our focus on skills for employment will be for the youths of every political party; we will construct roads in every region, continue to bring electricity to every district; develop agriculture in every chiefdom and provide free healthcare for the mothers and children of every village. The work starts today. We know Sierra Leoneans everywhere are celebrating this national victory. But let us celebrate within the law; let us celebrate with the grace, tolerance and goodwill that must be the corner stone of the job at hand. Let us, as we celebrate, be mindful that the work starts today, and every Sierra Leonean, from all political parties, regions, ethnic group, age, and religion is central to our Agenda for Prosperity. We must therefore embrace each other as we march forward with action, bravery, commitment, discipline, empathy and fortitude. I assure you all that with tenacity of purpose, and with great courage and determination, we will sustain our peace, democracy and development. The future beckons with high hopes for a prosperous Sierra Leone, whose sons and daughters will live together in peace and harmony, and enjoy the abundant fruits of our labour.